This harvest festival of Kerala is a visual treat for visitors, as people make colorful Pookalams or flower carpets in front of their homes, and work and business places as well; this is done to welcome the legendary King Mahabali, who was banished to the netherworld by Vamana but returns to visit his people at this time every year. The whole state is in a festive mood, with decorative lighting adorning buildings, people dressed in their best traditional outfits and sumptuous ‘sadya’ – traditional Kerala meals served on banana leaves – being served everywhere. The festival starts with ‘Atham’, in the Malayalam month of Chingam, culminating in Thiruvonam ten days later. In Malabar, a folk dance called ‘Ppulikkali’ is very popular; men paint their bodies and wear masks and headgear to resemble tigers and leopards, and dance on the streets. In the backwaters of South Kerala, several snake-boat races are held. Many domestic and international visitors throng Kerala in this season (August end to mid-September) to be a part of these festivities. Check out complete details of Onam Festival Of Kerala here. We at HTOIndia also organize a fixed departure Kerala Onam tour every year. 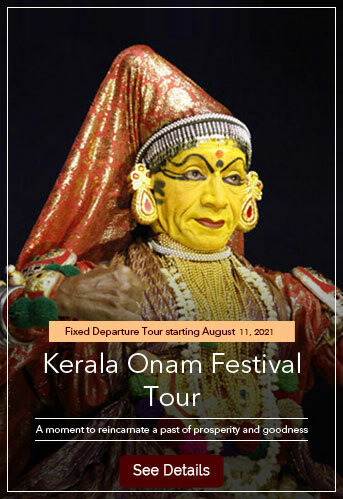 Checkout details of Kerala Onam Festival tour 2018 here. You may be interested in check out our Kerala tour packages as well. Held sometime during October-November, this cattle fair draws huge crowds from the home state of Rajasthan, and visitors from India and abroad. Believers come to take a dip in the holy waters of Lake Pushkar. Locals play traditional games, put on dances and acrobatic shows and set up stalls to sell locally made clothes, curios, footwear, and handicrafts. The main attraction is the buying and selling of camels, goats, and sheep. Located in thenorthernmostt state of Kashmir, the tiny hamlet of Hemis in Ladakh hosts the Hemis festival in early June, to honor Lord Padmasambhava, the founder of the sect. The Tibetan Buddhist monks of the Hemis monastery perform the mysterious and exotic ‘chaam’ dance, their faces covered with elaborate masks and headgear. Enter the mystic world of tantric Buddhism and be mesmerized by the graceful movements of the monks as you sip on locally brewed country liquor – a major attraction of the festival. You can also try Tibetan delicacies like thukpa and momos, and shop for curios at the specially erected stalls. The biggest and most important festival for a major part of India, Diwali, the festival of lights is celebrated around October-November. People make intricate ‘rangolis’ or designs using colored powders just outside their doors, light earthen lamps, and hang beautiful lanterns during this festival. It’s definitely a visual treat for visitors – nearly every house and building is adorned with festive lighting. It’s also a time for exchanging gifts and sweets – a lot of sweets! Lasting over 5 days, each day of Diwali has its own significance, but the importance is given to the worship of Lakshmi – Goddess of wealth. Visitors can also look forward to seeing spending fireworks displays all over the country during these days. Literally meaning ‘9 nights’, this festival celebrates the victory of Goddess Durga over the eveil demon Mahishasur; it is believed that she killed him after nine days and nights of battle. It is a celebration of ‘stree shakti’ – the intrinsic strength of the woman. In northern India, many people fast for nine days. In Gujarat, the nights are alive and vibrant, with ‘dandiya-ras’ (group dance where participants dance with two sticks to pulsating rhythmic drum beats) events held in numerous grounds and parks. Visitors can watch, or participate in these dances. In Bengal, the statue of the Goddess is consecrated and worshipped for nine days after which it is immersed in water on the last day of Dussehra. Dussehra comes exactly 20 days before Diwali. This festival is celebrated in the south Indian state of Tamil Nadu, as a way of thanking the Nature Gods for their benevolence. People make beautiful geometric designs in their courtyards with rice batter. Women cook rice and milk in small earthen pots till it spills over – Pongala – and offer it to the Sun. Visitors can experience the quaint custom of people decorating and worshipping their cattle, watch traditional sports, attend music concerts and dance performances that are held all over the state. Temples of Tamilnadu are famous as well as. These are three separate events held around April to June, in eastern India. Visitors have much to look forward to like the magnificent ‘rath yatra’ or chariot journey of Lord Jagannath, of which they can be a part; performance of ‘danda’ or dangerous and self-harming acts by bhoktas, devotees of Lord Shiva, the Chandak puja held in connection with the chandak jatra.